Human communication is evolving, and it is evolving in an accelerated way. Can you feel the acceleration? It really makes you wonder what is the next thing and when will we know about it? Also, it seems to be reaching some type of limit as no technology can be adopted in less than 1 year, or can it? 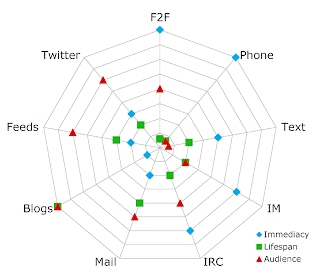 The article measures for each communication type three variables: immediacy, audience and lifespan and analyzes the holes trying to predict/invent the future new communication channels.